I hesitate to use the term 'bucket list' for fear of accidentally linking myself with Jack Nicholson, but with a week or so remaining in Brooklyn, I have no choice but to create a mini-list of things to see before we leave for the West Coast. 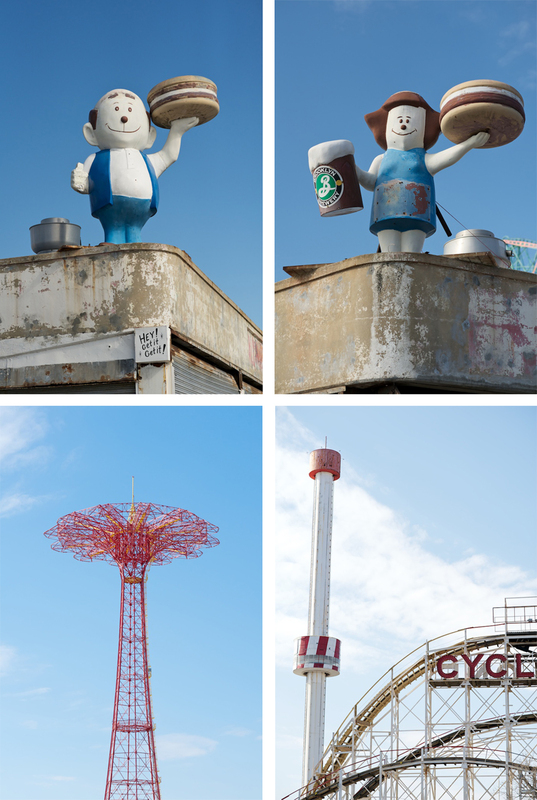 On Saturday, we crossed "visit Coney Island" off the list. 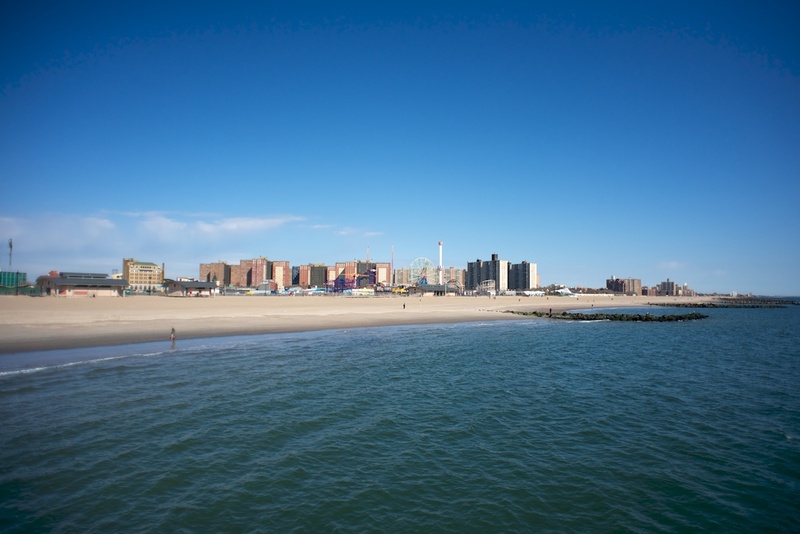 Coney Island is an iconic landmark, located on a small peninsula on the southern tip of Brooklyn. 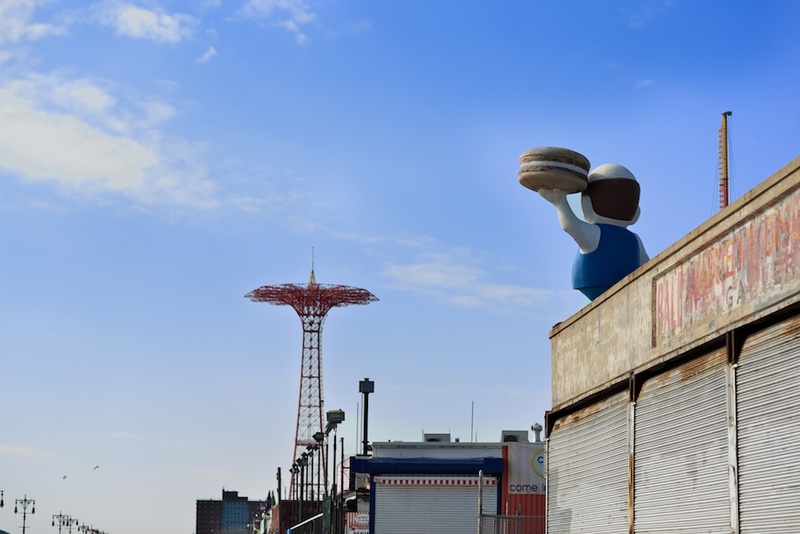 Until Saturday, my closest encounter with Coney Island was communicating with a publicist from the Brooklyn Cyclones for an old job. 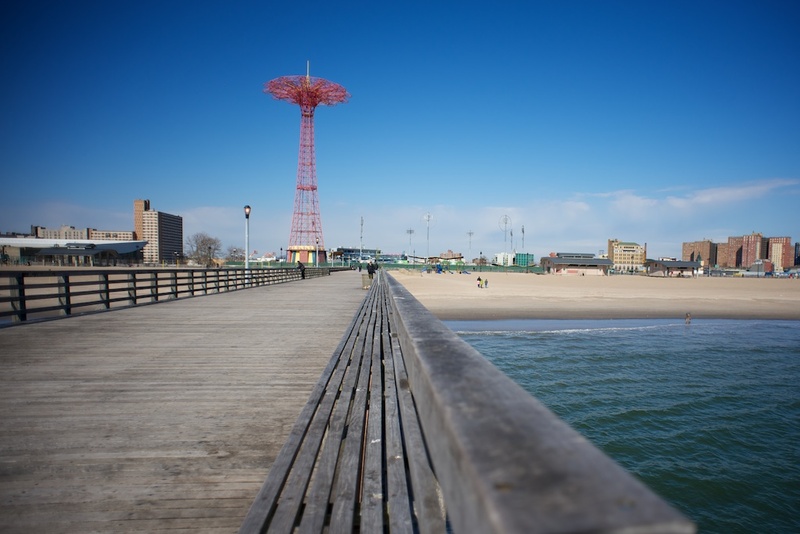 I'd seen Coney Island in newer, darker movies like Requiem for a Dream and The Wrestler (both films by Darren Aronofsky, who grew up in neighboring Brighton Beach), but couldn't envision how these images related to Coney Island in its heyday, the period of The Great Gatsby. Last weekend, we boarded an N train to find every subway car nearly empty, completely unremarkable for a train moving towards Coney Island on a Saturday in February. When we exited at the final stop, I commented that the subway station didn't resemble the other Brooklyn and Manhattan stations: its sweeping expanse resembles London's Paddington Station much more than Times Square. The station is clearly built to hold throngs of people rushing around, though we joined only a handful of people milling about. The first thing you see when you leave the station is the giant Nathan's hotdog eating contest sign, accompanied by a countdown sign to the next contest (110 days, or so). I quickly looked away: eating contests are not my thing, especially when hot dogs are involved. 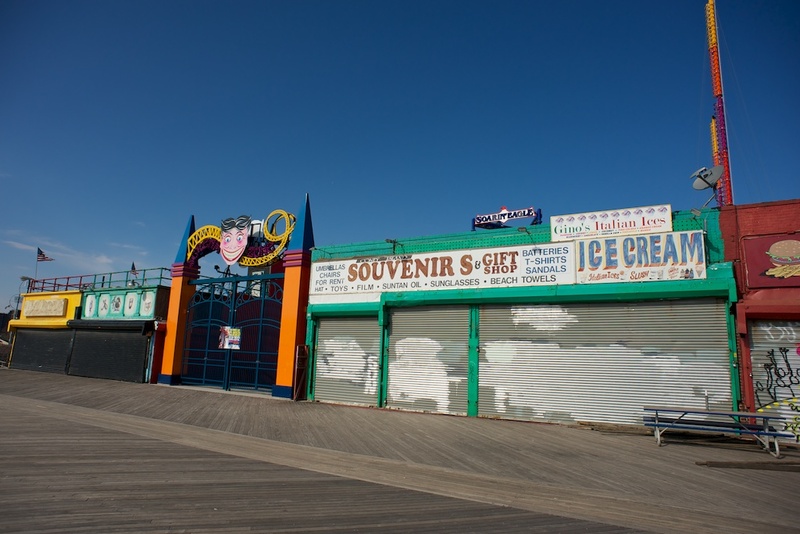 We walked toward the boardwalk and past the shuttered rides. The rides are colorful and of the older variety. This shut amusement park brought to mind a scene from Zombieland where the main characters use the rides to flee from zombies. 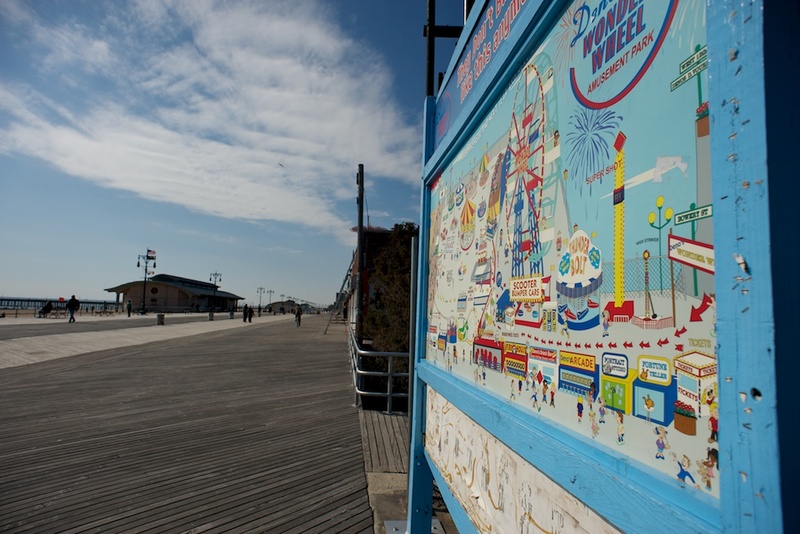 Banishing that thought, we crossed onto the boardwalk, a two and a half mile walk that spans from Coney Island to Brighton Beach. Many people, mostly residents, were walking, chatting, and running, including several older men in short shorts and nothing else (the temperature was 40 degrees, at best). We took the opportunity to walk out on the Steeplechase Pier for a view of all of the amusements, before ambling back down to the boardwalk and past the infamous Cyclone roller coaster. 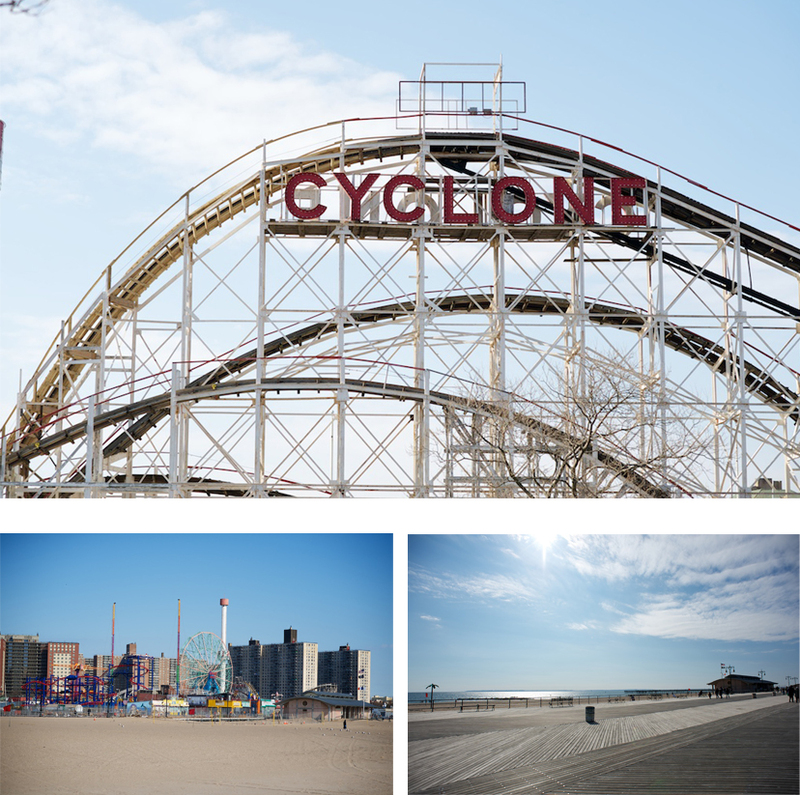 It's melancholic for me to think of Coney Island in its more popular days before World War II. In some ways, when I look at the colorful older rides and attractions, I can picture couples and families enjoying the beach and amusements and staying at regal hotels for a true holiday, but in other ways, that era seems centuries past. 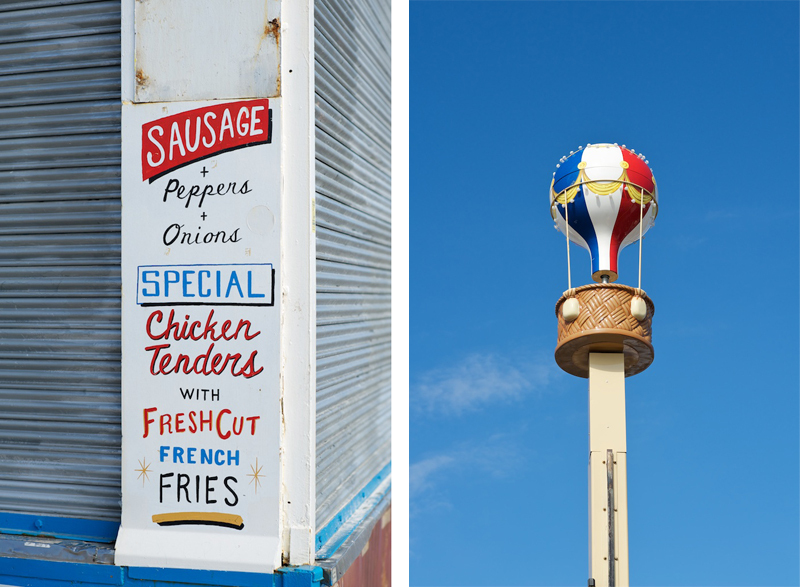 For incredible imagery of abandoned Coney Island, including partially hidden glimpses of its former glory years, visit this post from Scouting New York.